“For voters and reporters who have not had the opportunity to attend the local debates, and for those reporting on the activities of party leaders during this election, we provide this list of recordings that have been made in London ridings, and which can now be found on the web…” Click here to read the full media release. With the opening today of advance polls, Freedom Party leader Paul McKeever commenced a billboard campaign that will put his candidacy front and centre in the minds of voters in London West…” Click here to read the full media release. “Freedom Party leader Paul McKeever (candidate in the riding of London West) today is warning that the Progressive Conservative proposal to fund religious schools with taxpayer dollars would deprive participating religious schools of constitutionally-entrenched protections of their religious freedom…” Click here to read the full media release. “Freedom Party of Ontario leader Paul McKeever today announced that Freedom Party has nominated Kingston resident Mark Fournier as its candidate for the riding of Kingston and the Islands for the coming provincial election. 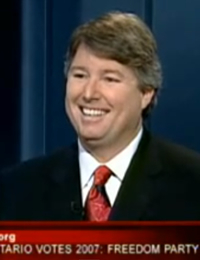 The 54 year old Fournier is co-founder of Canada’s most influential political discussion forum, www.freedominion.ca…” Click here to read the full media release. “Freedom Party of Ontario leader Paul McKeever today wants some answers from PC leader John Tory, after at least one PC candidate has chosen to hide behind the courts in defence of the PC party’s disastrous proposal to fund private religious schools…” Click here to read the full media release. 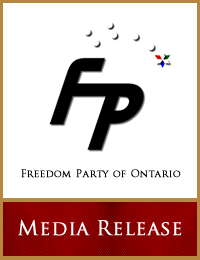 “Freedom Party today released its first video election message for the 2007 Ontario general election…” Click here to read the full media release. “With the Ontario provincial election fast approaching, a tally of statistics drawn from the popular video website www.youtube.com shows the general viewership’s interest in Freedom Party’s videos outstrips interest in videos produced by the Progressive Conservatives and Liberals…” Click here to read the full media release.